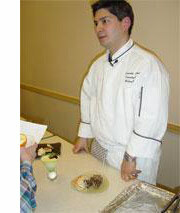 Chef Michael Lyons enjoys giving food demonstrations for the staff and clients of The Gathering Place. Every one of us has our own preferences for comfort foods. Mashed potatoes. Meatloaf. Soup. Sweet treats. The appreciation and value of comfort food is highly regarded at The Gathering Place, whose mission is to serve those people whose lives have been touched by cancer. Recently, Gathering Place staff and clients spread out the welcome mat for Chef Michael Lyons, owner of Accessible Gourmet. This affable chef has been volunteering for the past year at The Gathering Place, presenting classes that feature healthy, easy-to-fix gourmet comfort foods. Lyons, whose wife is Cleveland Clinic oncologist Dr. Janice Lyons, is as passionate about preparing good food as he is about using his considerable culinary skills and dedication to help cancer survivors. He proved it by staying up until 2 a.m. to scoop out orange segments so he would have four dozen orange shell halves to fill with a blood-orange soufflé for his recent Gathering Place Valentine’s Day cooking demonstration. During the lively, interactive cooking session, where guests seared black and white sesame seed-coated raw tuna and filled portobello mushroom caps with a zesty fish salad mixture, he spiced the cooking demonstration with sage advice. After the cooking class, the tantalized guests dined on healthful gourmet food generously donated by Wild Oats. The Gathering Place will provide further food for thought with their upcoming wellness cookbook slated for fall 2006 publication. It will contain healthful food tips, comfort food, and gourmet recipes. For information about The Gathering Place, call 216-595-9546. Preheat oven to 450°. Blend tomatoes and garlic with 3/4 cup olive oil and salt and pepper. Spread on baking sheet and bake for approx. 40 minutes. Meanwhile, sauté onion in 1/4 cup olive oil until carmelized. Add basil; sautée 2 minutes more. Remove onions and basil from heat. After tomatoes roast and darken, purée all ingredients, including vinegar and stock, in blender until smooth. Pour into large sauce pot and simmer for 15 minutes. Use hand blender if needed to adjust consistency. Season as needed.